Tropical BODY WASH 6 fl oz. A fantastic clean that softens skin with a great Coconut fragrance. This Body Wash has a few improvements over the basic body wash. More lather, more vitamins with Aloe for a softer feeling skin and a Big Tropical scent of Coconuts. Big Coconuts body wash is formulated with Organic Aloe Vera, Vitamins A, E and Pro-Vitamin B5, Coconut Oil, Coconut Extract, Watercress Extract, Chamomilla Extract and our "Fresh Cut" Big Coconut fragrance. Your skin will feel softer with an unbelievable smell of the Tropics. 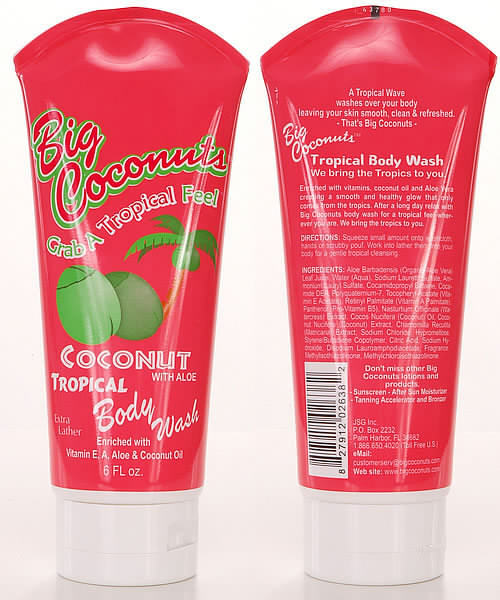 Big Coconuts Body Wash is extra thick for a rich lather. A small drop goes a long way. Now you can shower in the Tropics wherever you are. We Bring The Tropics To You.